Highlights of US statistics available from the US Department of Transportation Based on 2015 data. (released in June, 2017 and still the most recent). 37 Bicyclists 14 and under (7% of total) were killed in 2015. 5,000 were injured. Males killed 87%. Males injured 83%. 70% of fatal crashes were urban. 61% were not at intersections. 3% were in bike lanes. Fatalities were about half during daylight hours. Bicyclist deaths represented 2.3% of all 2015 traffic fatalities. 27% of the cyclists killed had been drinking. (Blood alcohol over .01 g/dl) 37% of the crashes involved either driver or cyclist drinking. The IIHS is consistently the best source of bicycle fatality statistics on the web. Their picture of a "typical" bicyclist killed on our roads would be a sober male over 16 not wearing a helmet riding on a major road between intersections in an urban area on a summer evening when hit by a car. "Each year about 2 percent of motor vehicle crash deaths are bicyclists. In a majority of bicyclist deaths, the most serious injuries are to the head, highlighting the importance of wearing a bicycle helmet. 1 Helmet use has been estimated to reduce the odds of head injury by 50 percent, and the odds of head, face, or neck injury by 33 percent. 2 Twenty-one states and the District of Columbia have helmet use laws applying to young bicyclists; none of these laws applies to all riders. Local ordinances in a few states require some or all bicyclists to wear helmets. The odds that a bicyclist will wear a helmet are 4 times higher after a helmet law is enacted than before a law is passed. 3 Helmets are important for riders of all ages, not just young bicyclists. Eighty-seven percent of bicyclist deaths are persons ages 20 and older. During the past few years, no more than 17 percent of fatally injured bicyclists were wearing helmets." The following facts are based on analysis of data from the U.S. Department of Transportation"s Fatality Analysis Reporting System (FARS). A total of 835 bicyclists were killed in crashes with motor vehicles in 2016. This represents a 1 percent increase from 2015 and is the highest number of bicyclist deaths since 1991. Although bicyclists deaths have decreased 17 percent since 1975, they have increased 34 percent since reaching their lowest point in 2010. Most bicyclist deaths in 2016 (87%) were those ages 20 and older. Deaths among bicyclists younger than 20 have declined 87 percent since 1975, while deaths among bicyclists 20 and older have more than tripled. In every year since 1975, many more male than female bicyclists were killed in crashes with motor vehicles. The decline since 1975 among female bicyclists (28 percent) was larger than the decline among male bicyclists (15 percent). The IIHS analysis was updated in December of 2017. They have tables, graphs and much more detail on their site. If that link has changed, see their research page and click on Bicycles. Estimated Number of Injuries in the United States and Territories that were treated in Hospital Emergency Departments. Footnote: NEISS data gives estimated national totals based on hospital samples. See this October, 2005 CPSC newsletter for more background and totals for other activities. BHSI Note: The most important data lacking here is exposure data that would indicate more about the riders and how much time they spend on their bikes in relation to the number of injuries for a given group. The following data has that for a comparison of sports. Bicycle lanes and helmets may reduce the risk of death. Large vehicles (trucks, buses) were involved in almost one-third (32%) of fatal crashes. Nearly all (94%) fatalities involved human error. All New Yorkers, whether pedestrians, bicyclists or motorists, can help prevent crashes by following traffic signs and signals and respecting other road users. Men and some children face particular challenges. Most bicyclists who died were males (91%), and men aged 45 to 54 had the highest death rate (8.1 per million) of any age group. Among children aged 5-14, boys had a much higher death rate than girls; Queens had the highest child bicyclist death rate of the five boroughs. The full report has more. Of 6,267 patients included in the study, 25.1% were helmeted. Overall 52.4% had severe TBI, and the mortality rate was 2.8%. Helmeted bicycle riders had 51% reduced odds of severe TBI and 44% reduced odds of mortality. Helmet use also reduced the odds of facial fractures by 31%. Conclusion: Bicycle helmet use provides protection against severe TBI, reduces facial fractures, and saves lives even after sustaining an intracranial hemorrhage. *Note: Reported incidence is known to be significantly underreported (up to 50%, McCrea Clin J Sports med 13:13-17, 2004) and do not reflect those that are treated by family doctors or other para-medical professionals. This article by Martin Eiermann draws on many statistical references to illustrate why riders don"t really care about statistics, but about perceptions of risk. Every year the estimated number of bicycling head injuries requiring hospitalization exceeds the total of all the head injury cases related to baseball, football, skateboards, kick scooters, horseback riding, snowboarding, ice hockey, in-line skating and lacrosse. Estimated indirect costs for injuries to unhelmeted cyclists are $2.3 billion yearly. In bicycle crashes, 2/3 of the dead and 1/8 of the injured suffered brain injuries. 95% of bicyclists killed in 2006 reportedly were not wearing helmets. Here are "head injury" statistics from CPSC, based on their data from hospital emergency rooms. Unfortunately, the head injury numbers for kids under 15 are not statistically significant, and even worse, all head injuries in the table are lumped together. You may be looking at a cut chin that required three stitches, or maybe at a severe concussion. But it is sure that you can not tell from these numbers what percentage should have been mitigated by a helmet. If the rider had one. Sports-related injuries among those ages 35 to 54 (Baby boomers) increased 33 per cent from 1991 to 1998. The population in that age bracket increased from 65 to 79 million, explaining some of the increase. In 1998, bicycling accounted for the largest number treated in hospital emergency rooms. Bike injuries were over 65,000, while basketball injuries in second place were under 50,000. In 1998, a total of 290 boomers died in bicycle crashes, with 255 involving a car (88 per cent). In 1998, no other sport killed as many boomers. Swimming was a distant second with 67 deaths, skiing third with 7 deaths. In 1998, baby boomers on bicycles died from head injuries at nearly twice the rate of children on bikes. CPSC believes that the difference in death rates is due to more helmet use by children. CPSC believes that 69 per cent of children wear bike helmets and only 43 per cent of boomers. It is important for baby boomers to stay active and participate in sports. "It"s estimated that 96% of cyclists killed in 1996 were not wearing helmets." Here is a link to a search for Carol Tan"s DOT Manual of Crash Types detailing the situations where bicyclists and pedestrians are most likely to be injured. Here is NHTSA"s history on bicycle deaths and injuries, published in early 2006. Statistics from a publication of the Centers for Disease Control. The National Summary of Injury Mortality Data provides tabulations of the total numbers of deaths and the mortality rates per 100,000 population for major and other selected external causes of death from injury, by race, gender, and age groupings. There are two sets of tables. The first set presents national data on injury mortality for 1986 through 1992 and will allow the user to assess short-term trends in numbers of deaths and mortality rates. The second set of tables summarizes national and state data for 1992 on the eight major causes of Injury mortality. The state tables provide a means of comparing the relative magnitude of deaths from these major causes within and across states. We computed age-adjusted rates by the direct method and standardized to the total U.S. population as enumerated in 1940. This method and the standard year of 1940 were used to be consistent with data reported by NCHS and with data being tracked for the year 2000 objectives of the U.S. Public Health Service (2). Our age-adjusted death rates may differ slightly from those of NCHS because we used 5-year age categories, as presented in our tables, for calculations and NCHS used 10-year age groups (3). For the convenience of the user, we have provided mortality rates for each of the race-gender-age groupings In which one or more deaths occurred. (Note: They did, but we did not! See phone number below for more tables. - BHSI) However, because NCHS considers rates based on 20 or fewer deaths to be statistically unreliable, such rates should be regarded with caution. For further details on this and other statistical issues, please refer to the Advance Report of Final Mortality Statistics, 1992 (3). (To obtain a copy of this report, contact NCHS at 301-436-8500). Below is the same data broken down by gender. Guess who has the problem! *Total number and crude rate include unknown age. **Age-adjusted rate excludes unknown age. Standard population is 1940 U.S. all races/both genders. Data Sources, National Center for Health Statistics Mortality Data Tapes for number of deaths; U.S. Bureau of Census population estimates; intercensal data are used for 1984-1989 and decennial census data are used for 1990. Demo-Detail postcensal population estimates are used for 1991-92. The FARS Database is the Fatality Analysis Reporting System put up by NHTSA - DOT. You can construct your own query to generate data on fatalities (not injuries, just fatalities) in your state, by year, by time of day, by many other criteria. They have some Frequently Used Queries as examples. Here is a link to a query on bicycle related head injuries on the CDC server. There is meat there if you can find it. It turned up about 17,000 pages for us! One drink increases a bicyclist"s probability of serious injury or death by a factor of six. Four or five drinks increases the probability by a factor of 20. One third of bicycle fatalities have elevated blood alcohol levels. 86 percent of bike accidents involved an automobile or truck. Only 11 percent involved a bike only and 3 percent a bike and pedestrian. The most common reason for an accident? Motorists failing to yield the right of way to a bike caused 42 percent of accidents. Another 39 percent occurred because cars were making a turn and didn"t notice a bike. Weather may be a factor. The pavement was wet in 12 percent of bike crashes. Booze is sometimes a factor. Bicyclists were noted as drinking in 7 percent of car-bike crashes. Only 3 percent of drivers had been drinking. Helmets may be reducing the number of deaths. There has been only one bicycling fatality on Madison streets since 1989. That death came last year when a 31-year-old man crashed at the comer of Gilman and Butler streets. He was not wearing a helmet. From January 2006 through December 2015, more than 2.2 million children age 5 to 17 years were treated in US hospital emergency departments (EDs) for bicycle-related injuries. This averages to 608 cases per day, or 25 every hour. Most injuries (45.7%) involved children 10 top 14 years of age and boys (72%). Helmet users were less likely to injure head or neck (OR: 0.52) and be hospitalized (OR: 0.71). Motor vehicle involvement increased the odds of bicycle-related traumatic brain injuries (TBIs) (OR: 1.98) as well as injury-related hospitalizations (OR: 4.04). The most common injury regions were upper extremities (36%), lower extremities (25%), face (15%), and head and neck (15%). The most common types of injury were bruises and scrapes (29%) and cuts (23%). Overall, traumatic brain injuries (TBIs) represented 11% of total injuries and were most common among patients 10 to 14 years of age (44%). About 4% of patients were hospitalized. National Highway Traffic Safety Administration data is broken down by state on their Web site, and there is more detail available. In 2005, 44 percent of nonfatal bicycle injuries occurred in children and youth age 5 to 20. In 2005, the rate per million of nonfatal bicycle injuries in children and youth age 5 to 20 was 462.17 compared to 153.3 overall. In 2005, children and youth age 0 to 20 made up 23.4 percent of bicycle fatalities. In 2005, the rate per million of bicycle fatalities in children and youth age 5 to 20 was 4.37 compared to 2.64 overall. In 2005, children under 15 accounted for 53 percent of bicycle injuries treated in emergency departments. From 1999 to 2002, the average annual cost of bicycle fatalities in children and youth age 0 to 19 was $1.03 billion. From 1999 to 2002, the average annual cost of nonfatal bicycle injuries in children and youth age 0 to 19 was $3.6 billion. Head injuries accounted for 62.6 percent of bicycle fatalities. Collisions with motor vehicles accounted for 75.7 percent of bicycle fatalities. 61.7 percent of motor vehicle collision deaths were due to head injury. CPSC staff has reports of an annual average of 80 children under 16 years of age who died in bicycle-related incidents in recent years. About half of the 500,000 bicycle-related emergency room-treated injuries in 2007 involved children under the age of 16. When taking part in other recreational activities, CPSC recommends that you wear the right helmet for that activity. Their "Which Helmet for Which Activity" publication helps parents choose the most appropriate helmet. Q. Which sport is most likely to crash-land you in a hospital emergency room? A. Bike accidents crash-land more kids in hospital emergency rooms than any other sport. In fact, kids ages 5 to 14 get hurt more often than bikers of any other age! Every day, about 1,000 kids end up in hospital emergency rooms with injuries from bikes - like broken bones or brain concussions. About one kid every day dies of these injuries. Others suffer lifetime problems, like limping or brain damage. Bicycle-Related Injuries Among Children and Adolescents in the United States. Describes the epidemiology of US bicycle-related injuries among children and adolescents 18 years and younger. Analyzes NEISS data for patients seen in emergency rooms 1990 to 2005 who were injured while operating a bicycle. During the study period an estimated 6,228,700 individuals 18 years and younger were treated for bicycle-related injuries. Children with head injuries were more than 3 (relative risk, 3.63) times as likely to require hospitalization and were almost 6 (relative risk, 5.77) times more likely to have their injuries result in death. The authors concluded that the large number of bicycle-related injuries indicates that prevention of these injuries should remain an important area of bicycle safety research and practice. Please check their Web page for their latest Fact Sheet on Bicycle Injury. In 2001, nearly 314,600 children ages 14 and under were treated in hospital emergency rooms for bicycle-related injuries. Nearly half (47 percent) of children ages 14 and under hospitalized for bicycle-related injuries are diagnosed with a traumatic brain injury. More than 40 percent of all bicycle-related deaths due to head injuries and approximately three-fourths of all bicycle-related head injuries occue among children ages 14 and under. Children can be seriously hurt from colliding with handlebars during a fall, even in low speed bike crashes. One national study of seriously injured bicyclists found that handlebar impacts accounted for 22 percent of injuries among nonhead-injured children. Improper bicycle sizing may predispose a child to falling and expose more of his trunk to the handlebar. Children are more likely to die from motor vehicle-related bicycle crashes at nonintersection locations (74 percent), during the months of April through October (81 percent) and between 3 p.m. and 7 p.m. (55 percent). Nearly 60 percent of all childhood bicycle-related deaths occur on minor roads.The typical bicycle/motor vehicle crash occurs within 1 mile of the bicyclist"s home. Children ages 4 and under are more likely to be injured in nonstreet locations around the home (e.g., driveway, garage, yard) than are children ages 5 to 14. Children ages 14 and under are nearly four times more likely to be injured riding in non-daylight hours (e.g., at dawn, dusk or night) than during the daytime. Among children ages 14 and under, more than 80 percent of bicycle-related fatalities are associated with the bicyclist"s behavior, including riding into a street without stopping, turning left or swerving into traffic that is coming from behind, running a stop sign, and riding against the flow of traffic. Riding without a bicycle helmet significantly increases the risk of sustaining a head injury in the event of a crash. Nonhelmeted riders are 14 times more likely to be involved in a fatal crash than helmeted riders. Children ages 10 to 14 are at greater risk for traumatic brain injury from a bicycle-related crash compared with younger children, most likely because helmet use declines as children age. Helmet use is lowest (for all ages) among children ages 11 to 14 (11 percent). Correct fit and proper positioning are essential to the effectiveness of bike helmets at reducing injury. One study found that children whose helmets fit poorly are at twice the risk of head injury in a crash compared with children whose helmet fit is excellentIn addition, children who wear their helmets tipped back on their heads have a 52 percent greater risk of head injury than those who wear their helmets centered on their heads. Children ages 14 and under are five times more likely to be injured in a bicycle-related crash than older riders. Males account for 82 percent of bicycle-related deaths and 70 percent of nonfatal injuries among children ages 14 and under.Children ages 10 to 14, especially males, have the highest death rate of all ages from bicycle-related head injury. Bicycle helmets have been shown to reduce the risk of head injury and the risk of brain injury. Bicycle helmets have also been shown to offer substantial protection to the forehead and midface. It is estimated that 75 percent of bicycle-related fatalities among children could be prevented with a bicycle helmet. Universal use of bicycle helmets by children ages 4 to 15 could prevent between 135 and 155 deaths, between 39,000 and 45,000 head injuries, and between 18,000 and 55,000 scalp and face injuries annually. Child helmet ownership and use increases with the parent"s income and education level, yet decreases with the child"s age. Children are more likely to wear a bicycle helmet if riding with others (peers or adults) who are also wearing one.In a national survey of children ages 8 to 12, 53 percent reported that a parental rule for helmet use would persuade them to wear a helmet, and 49 percent would wear a helmet if a state or community law required it. Currently, 21 states, the District of Columbia and numerous localities have enacted some form of bicycle helmet legislation, most of which cover only young riders.At least five states now require children to wear a helmet while participating in other wheeled sports (e.g., for scooters, inline skates, skateboards). Various studies have shown bicycle helmet legislation to be effective at increasing bicycle helmet use and reducing bicycle-related death and injury among children covered under the law.One example shows that in the five years following the passage of a state mandatory bicycle helmet law for children ages 13 and under, bicycle-related fatalities decreased by 60 percent. Police enforcement increases the effectiveness of these laws. One recent study reported that the rate of bicycle helmet use by children ages 14 and under was 58 percent greater in a county with a fully comprehensive bike helmet law than in a similar county with a less comprehensive law. The total annual cost of traffic-related bicyclist death and injury among children ages 14 and under is more than $2.2 billion. Every dollar spent on a bike helmet saves society $30 in direct medical costs and other costs to society. If 85 percent of all child cyclists wore bicycle helmets in one year, the lifetime medical cost savings could total between $109 million and $142 million. A review of hospital discharge data in Washington state found that treatment for nonfatal bicycle injuries among children ages 14 and under costs more than $113 million each year, an average of $218,000 per injured child. Helmets In EMS incidents where helmet usage was recorded, cyclists wore helmets in less than 50% of incidents. Men wore helmets in 43% of incidents, women 60%. This is substantially lower than the citywide helmet usage rate of 72%, which includes variation by neighborhood. The difference between helmet usage citywide versus in EMS incidents may imply that those who wear helmets are less likely to require EMS attention. Further, the varying helmet use by neighborhood may lead to disproportionate rates of EMS incidents by neighborhood. Between 2010 and 2012, the Boston Police Department was not reliably recording helmet usage. A majority of the cyclist crashes that resulted in injury involved motor vehicles. We found no randomized controlled trials, but five well conducted case-control studies met our inclusion criteria. Helmets provide a 66 to 88% reduction in the risk of head, brain and severe brain injury for all ages of bicyclists. Helmets provide equal levels of protection for crashes involving motor vehicles (69%) and crashes from all other causes (68%). Injuries to the upper and mid facial areas are reduced 65%. Helmets reduce bicycle-related head and facial injuries for bicyclists of all ages involved in all types of crashes, including those involving motor vehicles. Our response to comments from critics are presented in the Feedback section. Wearing a helmet dramatically reduces the risk of head and facial injuries for bicyclists involved in a crash, even if it involves a motor vehicle. Cycling is a healthy and popular activity for people of all ages. Crashes involving bicyclists are, however, common and often involve motor vehicles. Head injuries are responsible for around three-quarters of deaths among bicyclists involved in crashes. Facial injuries are also common. The review found that wearing a helmet reduced the risk of head or brain injury by approximately two-thirds or more, regardless of whether the crash involved a motor vehicle. Injuries to the mid and upper face were also markedly reduced, although helmets did not prevent lower facial injuries. Note: this team was the original 1989 source for the 85 percent effectiveness number that BHSI now has updated to the numbers above. Statistics from a 2013 study from Australia: The effectiveness of helmets in bicycle collisions with motor vehicles: A case-control study. "Helmet use was associated with reduced risk of head injury in bicycle collisions with motor vehicles of up to 74%, and the more severe the injury considered, the greater the reduction. This was also found to be true for particular head injuries such as skull fractures, intracranial injury and open head wounds"
Statistics from a study titled The Effect of Bicycle Helmet Legislation on Bicycling Fatalities by Darren Grant and Stephen M. Rutner. "A number of states passed legislation in the 1990s requiring youths to wear helmets when riding bicycles. The effect of this legislation on bicycling fatalities is examined using data from the Fatality Analysis Reporting System. A panel analysis is used to account for unobservable, time-invariant factors that may correlate with the incidence of laws across states. A control-group methodology is used to control for time-varying unobservable factors that may correlate with the implementation of laws within states. Timing issues are also explored. A helmet law reduces fatalities by about 15% in the long run, less in the short run. There is no evidence of spillover effects (to adults) or substitution effects (youths choosing other methods of transportation) associated with implementation of a helmet law. Through 2000 existing helmet laws have saved 130 lives. If all states had adopted helmet laws in 1975, more than 1,500 lives would have been saved." This link is to the medical journal article describing the Thompson and Rivara studies documenting the effectiveness of bicycle helmets. There are references at the bottom to other medical journal articles. This article is the authoritative source most often quoted on the potential for injury reduction by wearing a helmet. It is also scorned by opponents of helmet laws. Judge for yourself. This link is to the abstract of a second study by the same authors with somewhat different numbers for the effect of helmets in preventing head and facial injuries, last reviewed and updated in 1999. "Helmets provide a 63 to 88% reduction in the risk of head, brain and severe brain injury for all ages of bicyclists." BHSI"s parent organization, the Washington Area Bicyclist Association, has asked Federal agencies to correct their use of the often-cited 85% number in the first article. Preliminary results from the survey offer important insights. The median distance cycled per week ranged from 30 km in Israel to 150 km in Greece. The overall median distance among all participating countries was around 50 km per week. More than 40% of all cyclists commonly rode city/hybrid bikes, 20% rode mountain bikes, and 15% rode road bikes. More than 60% of respondents reported wearing a helmet "always" or "almost always", and nearly 30% report wearing them "never" or "almost never". Thus, both use and non-use of helmets seem to be strong habits that transcend times, situations, and locations. Approximately 25% of all respondents reported having been involved in at least one crash in the past year, with the lowest frequency in the Netherlands (15%) and the highest in Australia (46%) and Spain (45%). Among the most severe crashes, 53% were single-person accidents involving a fall. Less than 10% of crashes were reported to police, and only 32% of cyclists involved in a crash with a motor vehicle reported their accident to authorities. Further analysis of the complete survey results will be conducted to determine the influence of demographics, bicycle types, and attitudes about bicycling and helmet usage. Correlations between these factors and crash data will then be drawn. How many cyclists sustain head/brain injury? Annually, in the Netherlands, approximately 67,000 casualties of cycling crashes are treated at a first-aid department (Source: Injury Information System LIS), 8,000 cyclists are admitted to hospital (Source: National Medical Registration LMR), and 190 people die as a consequence of a cycling crash (Source Statistics Netherlands - Unnatural deaths). Of the seriously injured bicycle casualties2 admitted to hospital, a third were diagnosed with head or brain injuries (32%). Head injury is the general category and generally implies brain injury, but sometimes there is head injury without brain injury. Of the cyclists with serious injury who are admitted to hospital following a crash with motorized traffic, almost half (47%) are diagnosed with head/brain injury. After crashes not involving motorized traffic this is the diagnosis for just under one third (29%) of the cyclists. Proportionally, head/brain injury occurs most frequently among children and young people. In crashes with motorized traffic more than 60% of the young seriously injured cyclists (0-17 years old) have sustained head/brain injury; in the case of crashes not involving motorized traffic, the percentages range from 33 to 56% for these age groups (compared with the 29% average). Approximately three-quarters of all head/brain injury sustained by are the result of crashes not involving motorized traffic. For young children (0-5 years old) as many as nine out of ten head/brain cyclist-only crashes, i.e. crashes without another road user being involved, or crashes into an object. The risk of head/brain injury in crashes not involving a motor vehicle is particularly high for children in the age groups 0-5 and 6-11 years old; for cyclists over 65 the risk increases rapidly as they get older. Research has shown that a bicycle helmet offers protection against sustaining serious head or brain injury in crashes. The most reliable estimates indicate that at speeds of up to 20 km/h helmets reduce the risk of head injury by 42%, the risk of brain injury by 53%, and the risk of facial injury by 17%, whereas they increase the risk of neck injury by 32%. These estimates are partly based on research carried out in countries like the United States and Australia, where standards for bicycle helmets are stricter than they are in Europe and can offer protection at higher impact speeds. The European standard for bicycle helmets is not as strict as the standards in, for example, the US and Australia. At the present European standard the helmet is adequate in cyclist-only crashes, but offers insufficient protection in crashes involving other road users (Kemler et al., 2009). Therefore, the effectiveness of these non-European helmets cannot simply be compared with the helmets used in the Netherlands. "According to the Korea Road Traffic Authority, the number of bike accidents in 2013 was 4,249, but it increased to 5,659 in 2017. In addition, head injuries were the most common among bike accidents between 2012 and 2016, accounting for 38 percent, according to the Ministry of Health and Welfare." Cycling injuries are by far the most common injury from Canadian summer sports and recreational activity, accounting for half of all hospital admissions in this category. In 2009-2010, 4,324 Canadians were hospitalized as a result of a cycling injury, with close to half of these injuries occurring in June, July and August. While the annual number of cycling injury hospitalizations remained relatively stable between 2001-2002 and 2009-2010, the number of cycling-related head injuries decreased significantly, from 907 to 665, over the same period. Among the most severe cycling injury admissions of the past decade (those requiring admission to a special trauma centre), 78% of those hospitalized with a head injury were not wearing a helmet when their injury occurred. Transport Canada statistics show that 88 per cent of the 80 cyclists who died nationwide in 2001 were not wearing helmets. Stats from an article published in Pediatrics 2002; 110(5):e60. In Canada, the bicycle-related head injury rate declined significantly (45% reduction) in provinces where legislation had been adopted compared with provinces and territories that did not adopt legislation (27% reduction). Bicycle Associated Head Injuries and Deaths in the United States From 1984 Through 1988: How Many Are Preventable? Objective. -To estimate the potential benefits from more widespread bicycle safety helmet use. Design.-Review of death certificates and emergency department injury data for 1984 through 1988. Categorization of deaths and injuries as related to bicycling and head injury. Using relative risks of 3.85 and 6.67 derived from a case-control study and varying helmet usage from 10 per cent to 100 per cent, population attributable risk was calculated to estimate preventable deaths and injuries. Main Outcome Measures. -Numbers of US residents coded as dying from bicycle related head injuries, numbers of persons presenting to emergency departments for bicycle-related head injuries, and numbers of attributable bicycle related deaths and head injuries. Main Results. - From 1984 through 1988, bicycling accounted for 2985 head injury deaths (62 per cent of all bicycling deaths) and 905,752 head injuries (32 per cent of persons with bicycling injuries treated at an emergency department). Forty-one percent of head injury deaths and 76 per cent of head injuries occurred among children less than 15 years of age. Universal use of helmets by all bicyclists could have prevented as many as 2500 deaths and 757,000 head injuries, i.e., one death every day and one head injury every 4 minutes. Conclusions.-Effective community-based education programs and legislated approaches for increasing bicycle safety helmet usage have been developed and await only the resources and commitment to reduce these unnecessary deaths and injuries. Riley Geary has compiled and presented comparative fatality stats for the three countries. The format is stark, but easy to master in a few minutes, and the results are illuminating. In injury reduction we are well behind Australia (mandatory helmets) and the UK (fewer helmets than here). Is it possible that we are not doing something right? Here is the ITSA analysis of FARS fatality data. And here is the ITSA analysis reexamining the FARS helmet data. Assuming that cycle helmets are a good fit and worn correctly, they should be effective at reducing the risk of head injury, in particular cranium fracture, scalp injury and intracranial (brain) injury. when the mechanism of injury involves another vehicle glancing the cyclist or tipping them over causing their head to strike the ground. A specialist biomechanical assessment of over 100 police forensic cyclist fatality reports predicted that between 10 and 16% could have been prevented if they had worn an appropriate cycle helmet. 20% suffered "open wounds to the head", some of which are likely to have been to a part of the head that a cycle helmet may have mitigated or prevented. given that younger children are shorter than older children and adults, their head height would be within the drop height used in impact tests, so a greater proportion of single-vehicle accidents are likely to be covered by the Standard for children. No evidence was found for an increased risk of rotational head injury with a helmet compared to without a helmet. limitations in the available data, such as knowledge of helmet use and type of head injury. BHSI Note: We do not know how they got to their billions of kilometers traveled numbers, a number that nobody has been able to reliably estimate for cyclists in the US. We would also like to see this computed on the basis of exposure hours, since cars travel so much faster on highways than bicycles. The numbers for motorcycles are interesting. The big news in the report is that only 115 pedal cyclists were killed in the UK in 2007, an astounding improvement from the 350 killed there in 1984. Bicycle accidents occur two times out of three to children under 15. Accidents are associated with sports or leisure activities, close to home for the youngest group. Use of the bicycle for transportation is also responsible for a large number of accidents, and of those a large number of victims are over 65. Falls represent 90 per cent of the causes of the accidents. The head is hit in 38 per cent of the accidents. This figure rises to 55 per cent for infants of 1 to 5 years and 48 per cent for those of 5 to 10 years. Contusions are the most important lesions in bicycle accidents (40 per cent of the cases). The rate of fractures is equally large among children of 10 to 15 years of age and those over 65. The rate of hospitalization is high (18 per cent of the accidents). This figure rises to 30 per cent of the people from 45 to 64 years old and 40 per cent of those over 65. BHSI note: Includes any head injury, including areas not covered by helmets: ears, mouth, eyes and face. n/a = Sample size too small to report estimate. Includes injuries suffered participating in the activity and/or patients wearing the apparel and equipment associated with the activity. Includes injuries to head, ears, mouth, eyes, and face. *Includes cases where patient was admitted, was held for observation, was treated and transferred to another hospital, was dead on arrival, or died in the ER. To construct your own custom query for NEISS data, visit this CPSC page and be prepared to spend some time mastering the intricacies of the database! Sports-related injuries presenting at US hospital emergency rooms. Data for 2005. These would be the more serious injuries. There is no adjustment for exposure data to relate the number of hours spent by US residents in each of the activities. Dr. Tonino"s study was reported in the Washington Post on June 19, 2006. The teaser for this study (the link above) indicates that in the US in 2002 there were 51.7 million bicycle riders and they had 3.8 million injuries. Basketball led the list with 5.3 million injuries, followed by football with 4.0 million. For injuries per 1000 participants, they rank cycling fourth with 7.3, below basketball with 13.2, football with 32.3 and in-line skating with 11.4. Their numbers include both emergency room visits and less serious injuries, which they say are five times more numerous than those requiring emergency room care. They will sell you the full study for about $500 to $600. The teaser is an interesting read. (rest is obscured on their page). For more recent stats please see Dom Nozzi"s Listing of Comparative Risks. Half (50%) of bicyclists wear a helmet for at least some trips, with 35 percent using them for all or most trips. 46% of those 16 and older have regular access to a bicycle, with access increasing with increases in household income. 43 percent ride a bicycle at least once in the summer months, making an estimated 2.484 billion trips during the summer of 2002. Bicycling declines with age, with those under 20 most likely to bicycle and doing so more frequently, while the majority over 45 did not bicycle during the summer months. The majority of bicycling trips were for recreation or for exercise, while just one in 5 trips were made to conduct errands (14%) or for commuting to work or school (5%). About half of all trips (48%) were made on paved roads. An additional 13 percent were on shoulders of paved roads, and 5 percent on bike lanes on roads. One in 7 was made on sidewalks (14%) or bike trails/paths (13%). Only half (50%) of bicyclists say bike paths are available in the area they ride, while 32 percent say bike lanes are available. However, over half of those who do not use available bicycle paths or lanes say they don"t use them because they are not convenient, available, or go where they need to go. More than one in 10 bicyclists (13%) felt threatened for their personal safety on the most recent day they rode their bicycle in the past 30 days in the summer of 2002, with 88 percent of these feeling threatened by motorists. One in 5 bicyclists rode in the dark or near-dark for at least part of their trip, with 63 percent of these saying they took actions to make themselves more visible to motorists. About 4 percent of bicyclists or 2.04 million, were injured while riding in the past two years. About .5 million of these were hit by a motorist. Nine of 10 support helmet laws for children, while 62 percent support such laws for adults. Nearly half (48%) of those 16 and older are satisfied with how their local community is designed for making bicycle riding safer. About as many (47%) would like to see changes including more bike lanes (38%) and bike paths (30%). Note: BHSI does not endorse the optimistic findings of this next study! In addition, the total number of riders killed cited in point two has not been accurate for a decade, and current deaths each year are closer to 600. Wearing a bike helmet can reduce the risk of head injury. Of bikers who now report wearing a helmet, 98 percent said they wore a helmet for safety reasons, 70 percent said they wore a helmet because a parent or spouse insisted on it and 44 percent said they did so because a law required it. 69 percent of children under 16 wear a helmet on a regular basis while riding a bike, according to parents. 38 percent of adult bike riders regularly wear their helmets. Statistics from a publication of the U. S. Consumer Product Safety Commission. The exposure survey found that only 11.8 million (18 percent) of the entire population of about 67 million bicyclists wear helmets all or most of the time. Another 6 percent, representing about 4 million riders, reported that they wear helmets sometimes, but less than half of the time. The proportion of children under age 15 who wear helmets all or most of the time was about 15 percent. HF reports (in part IV) that the low usage rate for children may be partly related to peer pressure. Some studies show that children are not inclined to wear helmets if their social group disapproves of helmet use. However, helmet use in all age groups appears to be increasing. Just over half of the current users (53 percent) began wearing helmets in the last two years. And here is Michael Ravnitzky"s article on how to get better statistics from CPSC. Portland, Oregon, has been tracking bicycle traffic and helmet use since 1992, building a unique database. Here is their report through 2008. It has a chart of helmet use by year, and in the appendices are charts by year and gender. Their summary: "Helmet use is at an alltime high, and has risen steadily since the 1990"s. In 2008, 80% of recorded cyclists wore helmets, up from 63% in 1997 and 76% in 2007." The helmet counts track weekday transportation cyclists, not weekend recreational riders who would be likely to have lower helmet use. The numbers are impressively high, but most US communities should have higher helmet use rates for commuter and transportation cyclists. "Here in Seattle our OBSERVED helmet use in 1998 was 60% for children, 37% for teens and 71% for adults. We use a formal sampling scheme to select observation sites and then count helmet use among the bicyclists riding by. These observations have been done almost yearly since 1985. We also have had a very effective multifaceted helmet campaign plus legislation in the area surrounding Seattle. Helmet use in Washington state is 56% for western WA and 33% for eastern WA where campaigns have not been as intense. Helmet use does vary by area, but at least here the numbers are good and improving slowly." Source: Diane Thompson, MS, Epidemiologist, Harborview Injury Prevention & Research Center, Seattle, WA. By email, April 23, 1999. The Duval County Health Department estimates that "for every bike injury prevention intervention dollar ($1) spent in Jacksonville, FL an estimated $23.46 is saved in medical costs, public programs, property damage, future earnings and quality of life by our residents. Conclusion: 58% reduction since the Duval County bike safety program geared up. This study was based on observations at 136 sites on the islands of O"ahu, Maui, Kaua"i and the Big Island. BHSI note: we do not know why the variations are so large from year to year. Use this page to begin and search for "Helmets" either by State or by National level. Children 6 to 17 years old wearing helmets Always (38%) or Usually (15%) would total to 53% usually in helmets. The state breakdowns seem to track those numbers. In the subgroup breakdowns the high income group are reported as "Always" wearing helmets 48% of the time, with the lowest income group at 32%. Nationwide the 6 to 11 year old group are reported wearing helmets usually plus always as 63%. In 2004 the State of Utah published a ten year observational study of helmet use in Utah. It has pages of interesting statistics on helmet use by age groups as well as crashes. A risk survey conducted in 2008 and published in 2009 by Consumer Reports concluded that 58 per cent of American cyclists never wear helmets. It also showed that 24 per cent sometimes do not fasten their seat belts. Here is the press release describing the article. The survey is available to subscribers on the CU Web site. This article on a Consumer Reports poll taken in March 2009 says that "82 percent said they felt it was "very" or "extremely" important to wear a helmet while cycling, but only 44 percent said they would actually wear one." 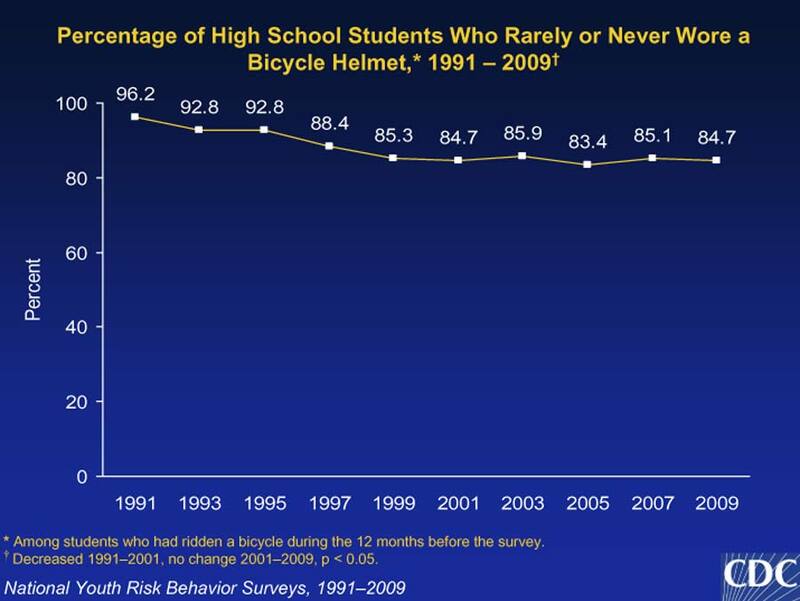 The US Centers for Disease Control reports that its National Youth Risk Behavior Surveillance System showed in 2009 that the percentage of high school students who rarely or never used a helmet while bicycling was 84.7 percent. The rate has improved since 1991, when it was 96.2 percent. We have a slide from their presentation. Sweden has conducted an international literature search, summarized in this study published in 2003. (See page four for the English abstract.) They found that helmet laws can achieve level of usage not achieved by education alone, that helmet laws reduce head injuries, and that helmet laws can result in a reduction of cycling by young people. We have the abstract up on our site if you can"t deal with the .pdf file. this article in the Korea Times indicates that 3 percent of Korean children now wear helmets, and "In 2008, bicycle accidents accounted for 14 percent of traffic accident victims with 46 percent of them being under 20 years old." They go on to give some numbers for the US: "In the United States, the helmet-wearing rate was 3.8 percent in 1991, but education and guidance campaigns raised the rate to 14.9 percent in 2007." We do not know their source for that. Here is a study from Western Australia that shows that helmet use has reduced the incidence and severity of head injuries there. It is based on hospital data, and shows that the number of closed head injuries was cut in half with increased helmet use over time, though other injuries did not change significantly in number. The head injuries were less serious, and hospital stays were shorter. 71 Percent of SF cyclists wear bike helmets. Reported July 25, 2011 in a blog of the San Francisco Examiner. I just got back from 3 weeks of counting bicycle helmets in Boston"s Back Bay. I replicated my 1996-97 observations and preliminary analyses indicate helmet use is holding steady at around 31-35 percent. Considering the huge medical and public health communities in Boston and the affluence of Back Bay where I collected the data, one would certainly expect helmet use among riders there to exceed any national average. "From a survey Bell conducted last year, we know that nearly 60% of kids don"t wear helmets when they ride bikes." Note: last year would have been 2004. Our own page on costs of treating head injured riders. These savings include $50 in medical costs, $140 in future earnings and other tangible resources, and $380 in quality of life costs. For each child bicycle helmet law that is passed, it costs $11 per new user and generates $570 in benefits to society. If 85 percent of all child cyclists wore helmets in 1 year, the lifetime medical cost savings would total $197 to $256 million. It is very expensive to treat a child with a bike-related head injury. These medical costs may sometimes last the child"s lifetime. For example, in 1991, bicycle crashes to children ages 4 to 15 caused 52,000 nonfatal head injuries and 93,000 nonfatal face scalp injuries. Lifetime medical payments for these injuries will approach $394 million. 2,200 of the children who sustain these head injuries will suffer permanent disabilities that will affect their ability to work. Universal bicycle helmet use by children aged 4 to 15 would prevent 1,200 to 1,700 of these permanently disabling injuries. Every bicycle helmet saves health insurers $57 and auto insurers $17. Parents will spend less time and money caring for injured children. Lawyers will file fewer lawsuits seeking compensation for child cyclists" injuries. Universal bike helmet use by children aged 0 to 14 would prevent 212 to 294 deaths annually. Universal bike helmet use by children aged 0 to 14 would prevent 382,000 to 529,000 bicycle-related injuries annually. Helmet use among children aged 14 and younger is approximately 15 percent nationwide. Parents report that 85 percent of children who own bicycle helmets wear them. The usage rate does not vary by income. Note: All costs are in 2004 dollars and were computed using the methodology outlined by Miller, Romano, and Spicer. Numbers may not correspond to totals due to rounding. In 2010, the number of people injured by NOT wearing a bike helmet was 51,000--enough people to fill Nationwide Arena in Columbus 2 1/2 times. Currently in Ohio, estimates indicate that just 10-20% of children wear bike helmets, yet more than 70 percent of children ages 5 to 14 ride a bicycle regularly. 75 percent of bike-related fatalities would be prevented with a helmet. Helmet use can reduce the risk of head injury and severe brain injury. Apart from the automobile, bicycles are tied to more childhood injuries than any other consumer product, including trampolines, ladders and swimming pools. A $10 bike helmet saves healthcare system $41 per child. If 85 percent of the children injured in the U.S. per year wore helmets, we could save up to $256 million in just one year. We know of 22 state laws (including the District of Columbia) requiring minors to wear helmets while bicycling, and more than 201 local ordinances, some of which cover all ages. Please check our page on mandatory helmet laws for more current info. Depending on the particular measure that is employed, states with universal helmet laws have motorcyclist fatality rates that are on average 22-33% lower in comparison to the experience with no helmet law. Additionally, partial coverage helmet laws are associated with reductions in motorcyclist fatality rates of 7-10%, on average. The National Conference of State Legislatures, has a more detailed chart, listing the states that do not have laws, but when last checked was out of date. There is no good public source of current helmet market data that we know of. If you are researching the helmet market and call us to ask about these numbers we will not have anything to add to what is on this page! That goes for the Usage Rate numbers above as well. When we find out anything new, it appears here within hours. How Many Helmets are Sold Each Year? We have asked many manufacturers if they had a good estimate of how many helmets are sold in the US market each year. If they do have that info, they are not sharing it. So we are reduced to reporting rumor and speculation on this subject. The best guesses we have found are in the 12 to 15 million helmets per year range. For 2017 dollar amounts, see the Open PR estimate below. The bulk of those would be mass merchant sales, rather than the helmets sold in bike shops. The 4,800 bike shops in the US market were rumored to sell about 700,000 helmets in the May-June-July quarter of 2009. In the September 1, 2010 issue of Bicycle Retailer and Industry News, Easton-Bell"s Greg Shapleigh is quoted saying that they sold 11 million helmets in 2009 "across all brands and categories." That would include bike, hockey, football, snow and baseball helmets, but BRAIN reported that "the majority of those were for cycling." The article was not on BRAIN"s Web site when we last checked on September 3, 2010. But BRAIN published new numbers in its October 1, 2010 issue, attributed to the Leisure Trends Group. Based on a year that started in July 2009 and ran through June 2010, they estimated 1,661,036 helmets sold by bike shops totaling $88,573,775. From January 2010 to June 2010 they estimated a 6.64% decline in unit sales and a 3.00% decline in dollar value. The numbers included adult, child and helmet accessories. They did not estimate helmet sales by big box stores. Here is the article in Bicycle Retailer and Industry News where the numbers appeared. The National Bicycle Dealer"s Association may have more numbers, but you have to pay for their annual Specialty Bicycle Retail Study. It was $400 the last time we checked, and we could not publish the numbers here in any event. In addition to the US, our best rumors on the size of the global helmet market put the total at about 50 million helmets per year. Three very large Chinese OEM manufacturers who make helmets for other brands account for about half of that. But some of the numbers cited by US brands are included in that 25 million, since many US-branded helmets are made by Chinese OEM manufacturers. We do not have precise price trend information either. We noted a small price increase in advertised mass merchant sales prices in our area after 2000, ending in mid-2004 when Wal-Mart began marketing a helmet for $7.14, and others followed. In the May 1, 2002 issue of Bicycle Retailer and Industry News, reporter Matt Wiebe said that helmet sales in the US for 2001 totaled $150 million. He did not identify his source for that estimate, but in the next paragraph he did quote then Bell Sports" President Bill Fry. The NBDA says helmet sales increased by 4% in dollars and 2% in volume in 2014, indicating a modest price rise. Bell Sports informed us that they manufactured more than four million bicycle helmets per year in the US in 2002-03 although they have some models made in Asia. They did not give us total sales. If you need very old market estimates for comparisons, back in 1990, Bell Helmets was good enough to share with us their market estimates for total industry sales of bicycle helmets for 1989-1990. We were grateful to have these numbers from Bell, since they were not available to us elsewhere, and still are not. Bell cautioned at the time that the usage rates, which they referred to in marketingspeak as Usage Penetration rates, were approximate. "The worldwide market for Helmet is expected to grow at a CAGR of roughly 1.5% over the next five years, will reach 5590 million US$ in 2023, from 5130 million US$ in 2017." There are also stats on the percentage of national market share. We are not familiar with the source and don"t know anything about the quality of their research. Reporting on the NSGA"s 2015 edition of its Sporting Goods Market report. The report was published in mid-2015 and covers 2014 sales: "Bike helmets were up 4 percent in dollars and 2 percent in units. Total dollar sales for helmets were $195 million last year." The estimates are based on an annual online survey of more than 15,000 households. See the BRAIN article for more info. Bicycles and related products appeal primarily to a recreation market in the United States, though there is an influential and growing number of people using bicycles for transportation. Bicycle usage is at an all-time high, with over 100 million U.S. bicycle owners, a figure which has grown substantially each year since 1983, according to the Bicycle Institute of America. Of that 100 million, 55 million were adults (age 16 and up), while 45 million were children. 31 million adults rode regularly, defined as at least once a week. There were about 4.9 million bicycle commuters, 250,000 bicycle racers, 25 million mountain bike/hybrid riders, 1.7 million bicycle tourers, and 3.8 million participants in recreational bicycle events. How Many Cyclists are there in the US? See their August 2017 stats issue. There are finally polls that recognize the differences in responses from "occasional" riders and the more frequent ones. Covers the percentage of US residents with no access to a bicycle, for instance. Of the 44.7 million, 42.5 percent reported that they rode between six and 24 days during the year. Below are some rare stats that a manufacturer actually published, but they date back to the mid-1990"s and the manufacturer is no longer in business. Manufacturer 1993  1994  % 1995 est. Note: The brochure where this chart appears did not make it clear whether these estimates are for the U.S., North American or World helmet markets. It also does not say whether or not it includes the non-bicycle part of Headstrong"s sales of baseball, equestrian, ski, snowboard and skating helmets. Source is cited as "Various industry reports and internal estimates." Whatever the accuracy of the figures, we are indebted to Headstrong Group as the only manufacturer to publicly publish their estimates. How do dealers regard helmet brands? The NBDA once posted the results of a dealer survey rating helmet brands by consumer demand, availability, profitability, marketing support, etc. The Consumer Demand rankings were Giro, Bell, Pro-tec, Specialized, Trek, Louis Garneau and Vigor. The dealers ranked the product lines in order Giro, Specialized, Bell, Louis Garneau, Vigor, Trek. We can"t find it any more on the NBDA site, and did not note the year. Our page of scientific journal articles has many articles with statistics buried in them. Death and injury stats are available at DOT/NHTSA. This is the compilation through 2004, published in early 2006..
You will want to check out the stats on the Safe Kids home page. For broader scope, check out the DOT Bureau of Transportation Statistics page. Here are some hospital stats from Australia, put up by the Health Department of Western Australia. They include stats on car/bike vs. bike-only crashes, and they have a very informative chart on hospitalizations by nature of injury. And here is another report titled "Bicycle Injury Hospitalisations and Deaths in Western Australia - 1981-1995" with more numbers on how the proportion of head injuries declined. Here is lots of info on Adult Bicyclists in the U.S.: Characteristics and Riding Experience in 1996. How Many Active American Cyclists are There? There are 58.7 million Americans who are active cyclists. Thirty percent of them live in California, New York and Illinois. California accounts for 14.5 percent of the nation"s riders and 18 percent of all its mountain bike riders. These numbers are much lower than others often cited, including those from the U.S. Consumer Product Safety Commission. We do not have the definition of "active cyclist" to confirm how the total was reached. This data is contained in a study titled BIKETRAC Bicycling Participation and Usage Study. For more information on purchasing this study you can contact BMRI at (617) 277-5660. American Sports Data advertises a study that covers "Helmet Sports" nation-wide. We don"t know what it contains, since we can"t afford it. QYResearch Reports has another report you can purchase titled "Global Bicycle Helmet Market 2016: Research, Analysis, Growth, Trends and Market Synopsis." Leisure Trends Group launched a survey of bike shops in 2009. It covers sales by amount, bike brand and type. They did not survey the mass market, where the majority of bicycles are sold. Gluskin Townley Group is reported by Bicycle Retailer and Industry News to have a similar report on sales by bicycle shops. We don"t know if helmets are broken out or not. NPD Group of Paris has a global study that has a segment on helmets. MarketResearchReports.Biz has a report titled "Bicycle Accessories Market - Global Industry Trend Analysis 2013 to 2017 and Forecast 2018 - 2028." Again, we have not seen it and don"t know anything about it. This page was revised or reformatted on: March 18, 2019.